From the first moment we stepped onto the mat as 5th Kyus our Sensei used to tell us repeatedly that breathing and meditation were the essential disciplines we should put at the heart of our Aikido. Of course we all said “Yes Sensei”, but then, as young vigorous people, impressed by the fluid techniques of Aikido, we really couldn’t wait to just get stuck into practising the throws and flying about the mat making energetic ukemes. Many years of practise later I now know he was right. Breathing and Meditation are aspects of what we call Kenkodo, which translates as “the way of health”. 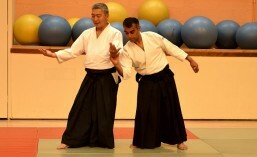 It also includes several other studies which are absolutely central to our Aikido. They are not optional extras. The more experience we gain the more that an immovable calmness of mind and a developed sense of timing become the essence of our Aikido practise. Along with an ability to create a relationship with our partners in which sensitivity of physical contact gives us a real feel for the intentions expressed though their movement. The practise of Kenkodo develops all these things…and more. There is the Art of Aikido and there is Living. Kenkodo relates to both of them. Aikido starts with a physical attack and tries, through harmonious means, to render it useless. It is a “do”, a way. A way is a pathway, a way forward, a way of discovery, a personal progress that happens over time and changes us, a deepening of understanding. It is enthralling in itself and opens us up to broader insights. But in general we are not physically attacked very often. The only people we have had in the club who have faced physical attack on an almost daily basis have been policemen. For the rest of us this is not a common problem. But as we live ordinarily day to day we will quite often face other conflicts, perhaps at work or in the family. We may have serious challenges arise in our careers or with our finances. Personally or with family members we may face ill-health or hospitalisation. There may be unforeseen tragedies. We will all, at some stage, face death and bereavement. Can we deal with these things like we deal with attacks in Aikido? Kenkodo offers this possibility. It applies equally to the Art of Aikido and the art of Living. It is central to the way on and off the mat. Teateho method of placing the hands. Misogi translates as Purification Practise – a more demanding form of breathing methods. All of these aspects of Kenkodo are included in our classes but can be further practised by ourselves at home. They do not all need a partner or mats but they do require some personal commitment. And all of these things contribute to the practise of Hitoriwaza which is the practise of Aikido techniques by ourselves without a partner. All of Kenkodo is an essential part of the “do”, the way of our Aikido. The growing effect of the time we commit privately will become clearly evident in the dojo, in our practise of Aikido with our partners, and it will also extend into our daily lives.